Ananda, built in 1979, is a sturdy, carvel-planked ketch that needs some work, but can provide a solid live-aboard for someone willing and able to do the work. She recently lost her bowsprit in a New England nor'easter, she has pockets of rot to be repaired, and some of her laminated ribs are no longer glued. She has an 80 hp Ford Lehman diesel that runs smoothly and strong, a Raymarine sonar/GPS/radar system, VHF radio, two 60lb CQR anchors, one 40b Danforth, and one 100lb hurricane anchor. She has about $15,000 worth of lead in her keel. If I could get that sum for her, everything else comes free. 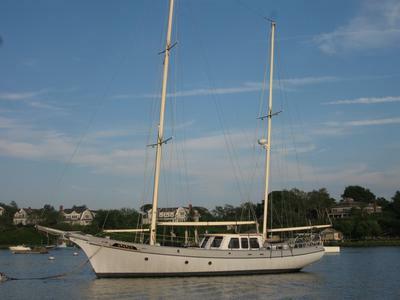 She lies in Portsmouth, RI now and she needs a new home soon. Ananda is no longer available. I have given Ananda to a person who has worked for Concordia. I expect she will have a solid future. David Lister looks like a nice boat don't think you would have a hard time selling her. Start with bow spit I made one for my sister few years back from lama net clear fir about 1500 with labour theirs the start. Then pictures of root blemishes and the laminated ribs, this may not be a problem for a handy man. Condition of sails inter-er pictures this will all help. This is a lot of boat but ans all you can think of the nice part is when you think back to better days of how she sailed why you lost interest. All wood can be replaced, the last hull out has she bin served. Return to Boats and Bits Exchange.